1. Karna ( कर्ण ) or Radheya is one of the central characters in the epic Mahābhārata, from ancient India. 2. Just like Jesus Christ of Nazareth the son of Maryam, Karna was the son of Yadav Princess Kunti from divine virgin birth with the blessing of Sun god. He was born to Kunti before her marriage with Pandu. 3. He was the King of Anga (present day Bhagalpur and Munger). 4. Karna was one of the greatest warriors whose martial exploits are recorded in the Mahābhārata, an admiration expressed by Krishna and Bhishma within the body of this work. 5. Karna was the closest friend of Duryodhana and fought on his behalf against the Pandavas in the famous Kurukshetra war. 6. Karna fought against misfortune throughout his life and kept his word under all circumstances. Many admire him for his courage and generosity. 7. It is believed that Karna founded the city of Karnal. 8. Many believe that he was the greatest warrior of Mahabharata since he was only able to be defeated by Arjuna along with a combination of 3 curses, Indra's efforts and Kunti's request. 1. Karna's mother was Yadav King Vasudeva's sister Kunti. 2. Karna was born before his mother's marriage to prince Pandu. While Kunti was a young woman, she served the sage Durvasa with utmost care when he visited her father Kunti-Bhoja's palace. Pleased by her service and hospitality, the sage foresaw that Kunti would have difficulty having a child after her marriage to Pandu, and granted her a boon. By this boon she could call upon any god of her choice, and receive a child through him. 3. Out of curiosity, Kunti still being unmarried, decided to test the power of the mantra and called upon the god Surya. Compelled by the power of this mantra, Sun god appeared before her and handed her a son. 4. The baby was wearing armour ('Kavacha') and a pair of earrings ('Kundala'). 5. Kunti was unwilling to be accused of being an unmarried mother and so with the help of her maid Dhatri, she placed the baby Karna in a basket and set him afloat on Ashwa a tributary of the river Ganges. 6. The child was found by Adhiratha, a charioteer of King Dhritarashtra of Hastinapur. Adhiratha and his wife Radha raised the boy as their own son and named him Vasusena. He also came to be known as Radheya, the son of Radha. The name Karna, however, denotes 'ear', because Karna was born with divine earrings. 7. Karna became interested in the art of warfare and approached Dronacharya, who was an established teacher and taught the Kuru princes, but refused to take Karna as his student, since Karna was not a Kshatriya. 8. After being refused by Dronacharya, Karna with his brother Shona's help started his own's education and appointed the sun god as his guru. Like the Irish mythological hero Cú Chulaind, who was possibly a young sun god, Karna was able to learn various martial arts in a very short time. 1. As Parshurama only taught to Brahmins, Karna appeared before him as a Brahmin and requested that he be taken on as his student. 2. Parashurama accepted him and trained him to such a point that he declared Karna to be equal to himself in the art of warfare and archery. 3. On a day towards the end of his training Parashurama requested Karna to bring a pillow for him to lie his head on. Karna offered his teacher his lap, but while Parashurama was asleep, a bee stung Karna's thigh. 4. Despite the pain, Karna did not move, so as not to disturb his guru's sleep. 5. As the bee bored deeper into Karna's thigh, the wound began to bleed. Parashurama was woken up by the blood and deduced at once that Karna was a Kshatriya and not a Brahmin, since only a Kshatriya could have endured such pain. 6. Parashurama, who had sworn vengeance against all Kshatriyas, laid this curse upon Karna that he would forget all the mantras required to wield the divine weapon Brahmastra, the most destructive weapon in archery, at the moment of his greatest need. 7. Karna pleaded that he was the son of Vasusena, a mere charioteer and not a Kshatriya. But while Parashurama regretted cursing him in a moment of anger, his curse was irrevocable. So he gave him as a gift the celestial weapon called Bhargavastra, along with his personal bow called Vijaya, for being such a diligent student. 1. Guru Dronacharya held a tournament at Hastinapur, to display the skills of the Kuru princes. 2. His student Arjuna was shown to be a particularly gifted archer. 3. Karna arrived at this tournament, however, and after surpassing Arjuna's feats, challenged him to a duel. 4. Kripacharya refused Karna his duel, asking first for his clan and kingdom; for according to the rules of duelling, only a prince could challenge Arjuna to a duel since he was a prince of the Kuru house. 5. Duryodhana, the eldest of the one-hundred sons of the blind king Dhritarashtra, knew that the Pandavas, the five sons of King Pandu, younger brother of King Dhritarashtra, were better than he and his brothers at warfare and saw Karna as a chance to get on even terms with them. 6. He immediately offered Karna the throne of the kingdom of Anga, making him a king and hence eligible to fight a duel with Arjuna. 7. When Karna asked him what he could do to repay him, Duryodhana told him that all he wanted was his friendship. 8. This event establishes key relationships in the Mahābhārata, namely, the strong bond between Duryodhana and Karna, the intense rivalry between Karna and Arjuna, and the enmity in general between the Pandavas (the sons of King Pandu and Madri and Karna'a mother Kunti) and Karna himself. 9. Karna was a loyal and true comrade to Duryodhana. He helped him to marry the princess of Chitragandha. 10. Following his accession to the throne of Anga, Karna took an oath that anyone who approached him with a request at midday, when he worshiped the sun, would not leave empty-handed. This practice contributed to Karna's fame as well as to his downfall, as Indra took advantage of it. Ultimately, Karna's unfailing generosity resulted in his death on the Kurukshetra battlefield. 1. Karna was a suitor for Draupadi at her swayamvara, or her choosing of a marriage partner. 2. Unlike most other contenders, he was easily able to wield and string the bow, but Draupadi refused to allow him to take part. 3. She rejected him for being a "suta-putra" - son of a charioteer. 4. The Pandavas were also present in the swayamvara, disguised as Brahmins. 5. Following the failure of the other princes, Arjuna stepped into the ring and successfully hit the target, winning Draupadi's hand. When Arjuna's identity was later revealed, Karna's feelings of hostile rivalry with him further intensified. 6. After Shakuni won a game of dice by trickery, Draupadi, now queen to all five sons of King Pandu, including Arjuna, was dragged into the court by Dushasana. 7. Duryodhana and his brothers attempted to strip her. Karna insulted Draupadi by saying that a woman with more than four husbands is nothing but a whore and that the Pandavas were all like sesame seeds removed from the kernel and she should now find some other husbands. 8. On the spot, Bhima, another of the Pandava brothers, vowed that he would personally slaughter Duryodhana and his brothers in battle. Arjuna subsequently swore to kill Karna. 1. The Pandavas were exiled, and during this time, Karna took upon himself the task of establishing Duryodhana as the Emperor of the World. 2. Karna commanded an army that marched to different parts of the country to subjugate kings and made them swear allegiance to Duryodhana, the king of Hastinapur or else die in battle. 3. Karna succeeded in all the battles. 4. In this military adventure, Karna waged wars and reduced to submission numerous kingdoms including those of the Kambojas, the Shakas, the Kekayas, the Avantyas, the Gandharas, the Madarakas, the Trigartas, the Tanganas, the Panchalas, the Videhas, the Suhmas, the Angas, the Vangas, the Nishadas, the Kalingas, the Vatsa, the Ashmakas, the Rishikas and numerous others including mlecchas and the forest tribes. 1. Following failed peace negotiations with Duryodhana, Krishna approached Karna, who was acknowledged as Duryodhana's finest warrior. 2. Krishna revealed to Karna that he was a Yadav Prince and the eldest son of Kunti, and therefore, technically, he was brother of Lord Krishna and the eldest Pandava, and asked him to change sides. 3. Krishna assured him that Yudhisthira would give the crown of Indraprastha to him. 4. Karna refused this huge offer because he had sworn fidelity to Duryodhana, and as such, was compelled to stay by his side despite his blood ties to the Pandavas. 5. He said that Yudhisthira was a righteous man, and knowing that Karna was older than he was, Yudhisthira would immediately give up his crown to him, he knew. 6. However, to repay his debt to Duryodhana, Karna would have to confer the crown of Indraprastha immediately onto Duryodhana, which Karna thought was against Dharma. 7. Krishna was saddened, but appreciating Karna's sense of loyalty, accepted his decision, promising Karna that his lineage would remain a secret. 8. However, Krishna's purpose - that of making Pandavas victorious - was served, as this revelation weakened Karna's hatred towards the Pandavas, his own younger brothers. 1. The Pandavas were exiled and eventual war seemed certain. 2. Indra, the king of the gods (Devas) and the father of Arjuna, realized that Karna would be invincible in battle and unable to be killed as long as he had the golden armour and earrings that he had been born with, so he conceived a plot to weaken Karna. 3. 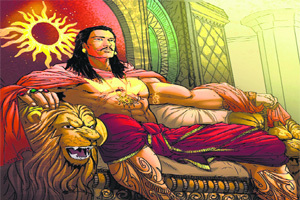 He decided to approach Karna as a poor Brahmin during Karna's midday sun worship. 4. Sun god warned Karna of Indra's intentions, however, exhorting him not to give away his armour and earrings. 5. Karna thanked Surya but explained that he was bound by his word and could not send anyone from his door empty-handed, even if it meant his death. 6. As Surya had warned, a disguised Indra approached Karna and asked for his kavacha (body armour) and kundala (earrings) as alms. 7. Karna readily gave them away, cutting the armor and earrings off his body. 8. Indra, shamed into generosity by Karna's gesture, reciprocated by giving Karna the boon to use his most powerful weapon, the Vasavi shakti, but only once. 9. It was then that Karna earned the name Vaikartana, as he cut the armour off his body without flinching. 1. The story relates that as war approached, Kunti met Karna to reveal to him that she was his mother. 2. Both of them shared a touching moment together but when she asked him to call himself Kaunteya (son of Kunti) instead of Radheya, Karna replied that he wanted the entire world to recognise him as a Radheya and not as a Kaunteya. 3. Kunti asked Karna to join the Pandavas, but Karna refused. 4. He told his mother that, had she been willing to acknowledge him all those years ago when he appeared at the tournament, then things might have been very different. 5. But it was too late now. He could not betray the trust of his friend. However, he promised his mother that he would not attempt to kill any of the Pandavas except for Arjuna. 6. Karna knew that Arjuna was under the divine aegis of Lord Krishna and hence would be invincible. But he knew that because of this he would be able to pay off Duryodhana's debt while performing the duties of an elder brother. 7. He told Kunti that she could only keep five sons – the fifth would either be himself or Arjuna. Karna requested his mother to keep their relationship and his royal birth a secret until his death. 1. Before the war began, Duryodana requested Bhishma, the commander-in-chief of the Kauravas, to consider Karna under his leadership. 2. Bhishma refused, saying that Karna had insulted his guru Parshuram by insulting Draupadi and nobody disrespecting his guru can fight under his leadership. 3. Bhishma secretly knew about Karna's true ancestary and did not want him to fight against his own brothers. 4. Consequently, Karna entered the battlefield only on the eleventh day, after the fall of Bheeshma. 1. Uncharacteristically, the battle on 14th day day extended into the hours of darkness. 2. Ghatotkacha, the half-asura son of Bhima, began to destroy the Kaurava forces. It was a characteristic of the asuras that they became extraordinarily powerful at night. 3. Duryodhana and Karna bravely stood and fought him. 4. Finally, when it seemed that Ghatotkacha would destroy all the Kaurava forces that very night, having already badly-wounded Dronacharya, Duryodhana called upon Karna to use all means necessary. 5. Karna engaged him in a ferocious duel, with every single warrior from both sides watching in silent awe. 6. As Ghatotkacha began to use his skills of dark magic, Karna had to use the Vasava Shakti, which had been gifted to him by Lord Indra in return for his divine armour. 7. Using this weapon, Karna killed the Asura Ghatotkacha. 8. Although his death was a major disappointment to the Pandavas, there was a serene smile on Krishna's face. 9. Krishna knew that, because Karna had now expended this fearsome weapon, Arjuna was no longer vulnerable to it. 1. Karna Parva is the name given to the Eighth Book of the Mahābhārata, describing days 16 and 17 of the Kurukshetra war. "Hear in brief, O son of Pandu! I regard the mighty car-warrior Karna as thy equal, or perhaps, thy superior! With the greatest care and resolution shouldst thou slay him in great battle. In energy he is equal to Agni. As regards speed, he is equal to the impetuosity of the wind. In wrath, he resembles the Destroyer himself. Endued with might, he resembles a lion in the formation of his body. He is eight ratnis in stature. His arms are large. His chest is broad. He is invincible. He is sensitive. He is a hero. He is, indeed, the foremost of heroes." 3. Karna single-handedly defeated all but one of the Pandavas on this sixteenth day of the Kurukshetra war, as related in the Mahābhārata. 4. He overcame Bhima but left him alive, saying that as Bhima was younger than he was, he wouldn't kill him. 4. He defeated Yudhisthira and also left him alive, saying that: "It seems that you have forgotten all the teachings which your guru has taught you, so first go and practice them and then come to fight". 5. Karna then defeated Nakula and Sahedeva but didn't kill them, since he had promised his mother to spare the lives of all the Pandava brothers except for Arjuna. 6. After defeating all of Arjuna's brothers, Karna asked his charioteer, Shalya, to drive his chariot to where Arjuna was standing. 7. Karna took his powerful weapon, Nagastra and shot it at Arjuna. 8. Krishna saved Arjuna from certain death by his divine powers; by subtly lowering Arjuna's chariot into the earth, through a gentle pressure of his feet. 9. An angry Arjuna showered all his arrows on Karna, but Karna neutralized them all with his own. 10. Karna then shot more arrows which incapacitated Arjuna and made him weaponless. 11. But the close of the day spared Arjuna's life, since both sides observed the codes of war and stopped fighting. 1. The much-awaited duel between Karna and Arjuna resumed. Both these warriors matched each other weapon for weapon. This famous duel was witnessed by the gods from the heavens. 2. Karna cut the string of Arjuna's bow many times. But at each instant he found Arjuna able to tie back the bowstring in the twinkling of an eye. 3. Karna praised Arjuna for this and remarked to Shalya that now he understood why people called him the greatest archer in the world. 4. Although the duel was evenly-fought for a long while, Karna was suddenly stricken by the playing-out of the curses that had been thrown at him and which would now put him in grave danger. 5. Hampered as his chariot wheel sank into the ground in loose, wet soil, he found himself unable to remember the incantations for his divine weapons, as his teacher Parashurama had foretold. 6. 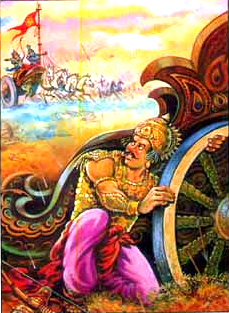 Descending from his chariot to remove the wheel, he requested Arjuna to wait, as the etiquette of battle allowed. 7. 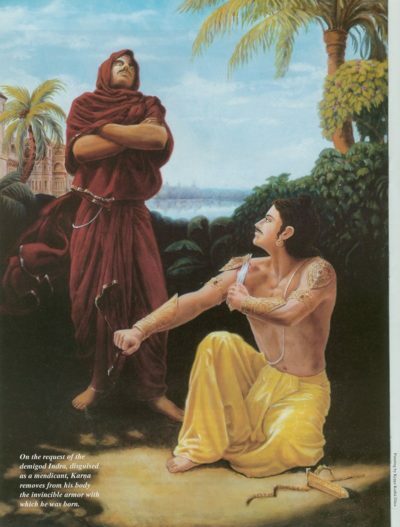 However, Krishna reminds Arjuna that Karna has no right to refer to etiquette at this point, having violated those same rules himself when killing Abhimanyu, participating in the laksha-griha conspiracy, assisting Duryodhana in the game of dice and insulting Draupadi in the Hastinapura court. 8. Lord Krishna reminds Arjuna that it is not adharma to kill a man who had supported evil all his life. 9. The recollection of these incidents enrages Arjuna and he uses the Anjalika weapon to decapitate Karna while the latter was trying to extricate his chariot wheel from the ground. 1. As Karna lay dying on the battlefield, his father Surya and Arjuna's father Indra fell into a debate as to who among their son's was superior. 2. Indra was convinced that Arjuna was the better while Surya said otherwise, stressing on Karna's charitable attitude. 3. Both of them decided to test Karna's generosity and with Lord Krishna appeared before him as Brahmins asking for alms. 4. Karna said that at this point he had nothing to give them while one of the Brahmins remark that he has some gold in his teeth which could be of use to them. 5. Karna on realizing this promptly takes a stone and breaks his teeth handing them over to the Brahmins and thus proving his superiority. 6. Krishna who asks for Karna's punya or merit and when Karna does so he is rewarded by sighting of Krishna's Vishwaroopa. 1. Following the Kurukshetra war, Tarpan vidhi were performed for all the fallen. 2. Kunti then requested her sons to perform the rites for Karna as well. When they protested, saying he was a Sūta, she revealed the truth of his birth. 3. The brothers were shocked to find that they had committed fratricide. Yudhishtira, in particular, was furious with his mother and laid a curse upon all women that they should never thereafter be able to keep a secret. 4. According to Karna's dying wish, Karna's Antim Sanskar was performed by none other than Lord Krishna himself. This was the honour given to him by Lord Krishna. Karna is the only person in the Mahābhārata epic who receives this great honour. 1. Karna's wives were Vrushali and Supriya. The names of nine of Karna's sons are mentioned in the Mahābhārata. Of these nine, only one survived the Kurukshetra war, and his name was Vrishakethu. 2. The nine sons of Karna were Vrishasena,Vrishaketu, Chitrasena,Satyasena,Sushena, Shatrunjaya, Dvipata,Banasena and Prasena. 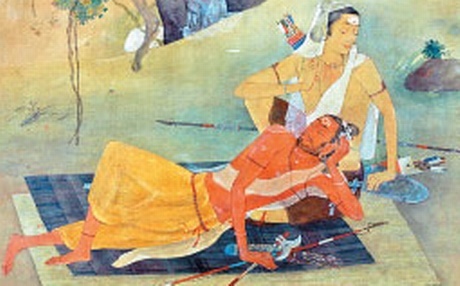 Prasena was slain by Satyaki in the war. 3. Shatrunjaya and Dvipata died in the Kurukshetra war at the hands of Arjuna, during the days when the guru Dronacharya commanded the Kaurava forces. 4. Banasena was killed in the war by Bhima. 5. Chitrasena, Satyasena and Sushena died at the hands of Nakula. 6. Karna's eldest son Vrishasena was killed by Arjuna during the last days of the war, when Karna commanded the battle forces. 1. Vrishasena's death illustrates some gruesome battle detail in the Mahābhārata. 2. Karna's son, angered at the death of his brother Chitrasena, rushed at Nakula. 3. A fierce battle ensued and Vrishasena managed to kill Nakula's horses and pierce him with many arrows. 4. Descending from his chariot and taking up his sword and shield, Nakula severed the heads of two thousand horsemen as he made his way toward Vrishasena. 5. Vrishasena, seeing Nakula coming towards him whirling his sword, shattered it with four well-aimed crescent-shaped arrows. 6. Nakula then quickly ascended Bhima's chariot and, as Arjuna came near, asked him for help. 7. Arjuna in turn sought Krishna's help and vowed to kill Vrishasena. 8. Vrishasena, however, was able to release many different kinds of arrows against them both, piercing Arjuna's arm and Krishna also. 9. Arjuna became enraged, and after threatening Karna with what he would do to his son, he struck Vrishasena with ten arrows and then with four razor-headed arrows, cut off his bow, his two arms and his head, adorned as it was with beautiful earrings. 10. It was this killing that prompted Karna to challenge Arjuna to fight. 1. Vrishakethu was the only one of Karna's sons to survive the horror of the Kurukshetra war. 2. He later came under the patronage of the Pandavas. 3. During the action that preceded the Ashvamedha, Vrishakethu accompanied Arjuna and participated in battles with Sudhava and Babruvahana. 4. During that campaign, Vrishakethu married the daughter of king Yavanatha, perhaps a king in the west. 5. It is recorded that Arjuna developed a great affection for his nephew Vrishakethu and trained him to be one of the best archers in the world.
. in karnataka . the kuruba people saying that they are belongs to surya vamsii. They are chandravanshi, because they trace their descent to Lord Krishna who was a Chandravanshi.